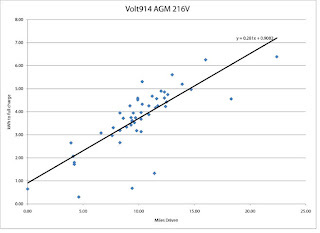 As you can see, the least-squares fit line shows that a good approximation of wall-to-wheels electricity use is a 910 Wh fixed overhead per charge, and about 280 Wh per mile. This is wall-to-wheels, so it accounts for all the efficiency losses of the AC-DC conversion process as well as the reverse DC-AC conversion for driving. Not too shabby! And, much better than the old 144V floodies with the Zivan NG-3 charger, which were giving me 1,230 Wh fixed overhead per charge and 380 Wh per mile wall-to-weels efficiency (!). Edit: Forgot to mention, at my current cost of 7.5 cents per kWh, I spent about $14 for the electricity for those 500 miles, at an average cost of 2.8 cents per mile. 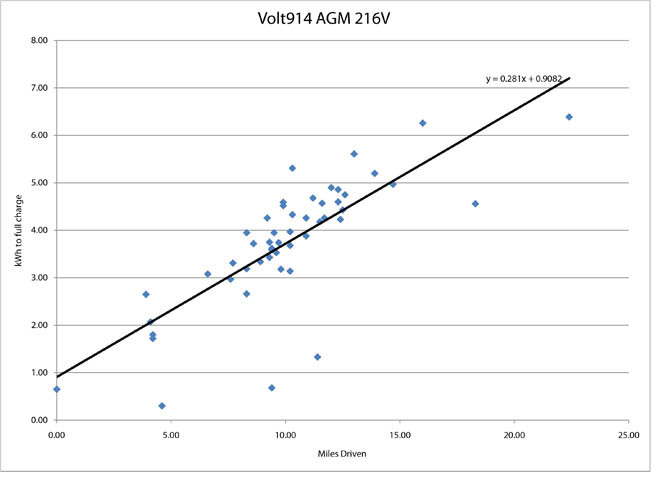 Which compares to 3.7 cents per mile with the old 144V system - a 25% reduction in cost.